The Apple App Store has tons of Apps to choose from and you can download it to your iOS device. But not all the apps are free. Some apps are paid, some are free, and some developers offer a limited trial of for the paid apps so that the iOS users can download and use the app before making the purchase. However, it happens that some developers don’t offer the free trial for their apps, and the iOS users are forced to buy or leave the app without trying it at all. This is where iNoCydia like apps shine. iNoCydia is a third-party app store and a very popular Cydia alternative that allows you to download and install tweaked and hacked apps onto your iPhone and iPad without a jailbreak. While iNoCydia may not exactly work like Cydia does, because it works on a non-jailbroken iOS device, it still offers a good number of tweaks for iOS devices. You can also download third-party apps that are not available in the App Store such as Emu4iOS emulator, MovieBox and more from iNoCydia and use it to play Game Boy games or stream movies and TV shows online for free. iNoCydia offers paid apps for free so that you can download any paid apps and try it before buying from the iTunes. Note: Service like Netflix are only able to make content if people subscribe to its service. If you can afford the Netflix subscription, do buy the service and avoid piracy. GBA4iOS, NDS4iOS, and more emulators. Compatible with iOS 8/9/10/11/12 devices. Launch the Safari browser on your iPhone/iPad and go to iNoJB.net. You should be redirected to another site for registering an account. An activation link will be sent to your registered email ID for the validation. Tap on the link to activate the account. 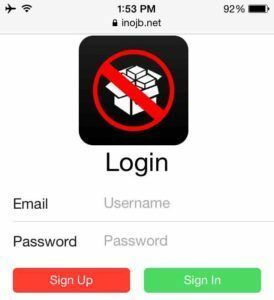 Once you have activated the account, you can start using iNoCydia on your iPhone. As I said, iNoCydia may not offer all the features of Cydia but it still offers enough to not to make you feel that you should have jailbroken the device to get more apps and games. iNoCydia offers a vast collection of tweaked and cracked apps that you can use before purchasing them on the iTunes. We do hope that more iOS developers provide a free trial for their apps so that the users can make an informed decision before making the purchase and also not go through all the third-party sources looking for the apps. Note: The web page may redirect you to some advertisers link, so make sure you can differentiate between an advert page and real downloading page to be on the safer side.